(Zuse and the computing of the square root) Powerpoint presentation for the Computarium, Diekirch, 26 Oct. 2010. In French. Supplementary part showing the solution of the square root by Zuse. L'art du secret: Part 1, Part 2, Part 3 (unfinished) 3 first parts of a 5 part lecture series prepared by Jean-Claude Asselborn. These conferences could not held due to his illness. Powerpoint. Mixed French and English. BAUMANN, Claude Das Kalman Filter wird 50 Article in the Luxemburger Wort (18 March 2010); co-author Francis Massen. (JASA, 138 (2), Aug. 2015) Claude Baumann, a Computarium crew member, has published an outstanding paper in JASA, the Journal of the Acoustical Society of America. The co-authors are Chris Rogers (Tuft University, USA) and Francis Massen (Computarium). 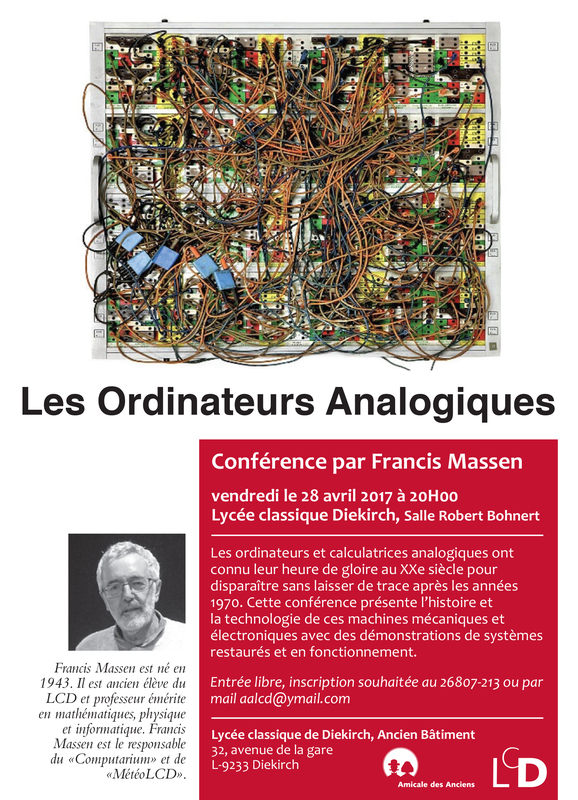 MASSEN, Francis Analog Computers (.ppt) (pdf version) Conference at the LCD held the 28th April 2017. Link to the Powerpoint presentation covering mechanical and electronic analog computers and calculators. Click here for the flyer.